Today in our metro column we gave ideas for how brides everywhere can have everything from invitations to tiaraâ€™s made to their specifications. You can read more about our wedding picks in our Wedding Guide. Get started with custom designing your invitations online. The internet is an amazing source for custom invitations, save-the-date cards and stationery in styles ranging from traditional to cutting edge. By Invitation Only Designs offers personalized service by Phyllis Roth, experienced art director and event planner, who has over 18 years of experience in the design and printing industries and will help you design your invite. Brides with their own ideas can logon, mock-up and preview their invites at ChelseaPaper.com. If youâ€™re stumped on wording you can even consult Ms. M, Chelsea Paper’s in house etiquette expert. This week the studio is having a Spring Wedding Sale, all invitations and stationery in the wedding albums is 10% off. Gay Isber creates custom bridal tiaras in her studio in Canada. Each piece is created using vintage beads but also exotics like red coral, opalite, catâ€™s eye, moon glow, rock crystal, opalite, amazonite, sugar beads, and more. Prices range from $20 – $450++. Jewelry designer Jeanne McCollisterâ€™s process begins with a questionnaire that helps determine the brideâ€™s taste she then designs a custom piece and emails a photo for the bride to review and make changes before the jewelry is finished. Sisters Michele & Melanie Bock of MelanieMichele.com custom make bridal jewelry and so much more. 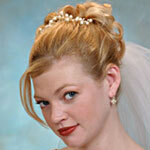 Brides to be can order up everything from earrings to custom hairpins to Feather headpieces to crystal cake toppers. Send the siblings a swatch of your ensemble and their designers will take of everything else, color matching it, emailing you pictures for your approval and own unique accessories to life. Design one-of-a-kind bridesmaid bags with 1154 LILL STUDIO custom handbag boutique. Choose from over 20 styles and hundreds of ever-changing fabrics to custom create matching bags for bridesmaids or a different look for each personality. Designer Jennifer Velarde created the concept store over five years ago because she loved seeing colors, patterns and textures come together as a handbag — and now brides can use the online handbag design tool to custom make accessories. 1154 LILL offers a discount of 10% to brides who order 5 or more bridesmaid bags. If you can pull yourself away from your computer then pay a visit to Tupli, on the Upper East Side of NYC, where brides can create one-of-a-kind shoes. The intimate salon houses European-imported materials such as, diamonds, beads, leather, suede, satin, color swatches, and anything else your feet desire. Brides work with a creative designer and illustrator and create their perfect Cinderella slippers. Each shoe is molded to the customerâ€™s feet in order to assure the best fit.